Laṭīfī in Âşık Çelebi’s Meşâ’irü’ş-Şuarâ, Meşâ’irü’ş-Şuarâ İstanbul Millet Kütüphanesi Ali Emîrî Tarih 34 Ae Tarih 772, 42a. 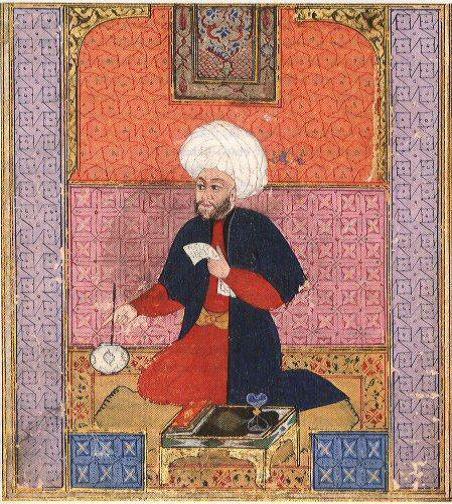 Laṭīfī (1491-1582) was an Ottoman bureaucrat and intellectual who lived in the 16th century, considered by many as the golden age of the Ottoman Empire. There is a dearth of information about Laṭīfī’s life. He is said have been an adherent of the family of Hamdi Çelebi, one of the poets of the age of Mehmet the Conqueror. He is also thought to be from the city of Kastomonu in Anatolia, and was descended from the Hatipzade family which is well-known in Kastomonu. There is no record of his education. According to his own account, he was well educated. At the age of 35, thanks to a treatise (risale) he wrote about Istanbul, he was promoted to a position as a government clerk in the European provinces and later served as a clerk in Belgrade at the Endowment of Ebū Ensārī, and in Rhodes in the chancery of the Lawgiver (Sultan Süleyman) Social Welfare Institution. Approaching the age of 80, Laṭīfī was living in Egypt employed in the Imperial bureaucracy. He appears to have returned to Istanbul in the last years of his life but planned to journey to Egypt again and thence to Yemen. Then, in his 90s, on the voyage to Yemen, he drowned, when his ship was sunk in a storm.